Description: October in Taylorsford, Virginia means it’s leaf peeping season, with bright colorful foliage and a delightful fresh crew of tourists attending the annual Heritage Festival which celebrates local history and arts and crafts. Library director Amy Webber, though, is slightly dreading having to spend two days running a yard sale fundraiser for her library. But during these preparations, when she and her assistant Sunny stumble across a dead body, Amy finds a real reason to be worried. 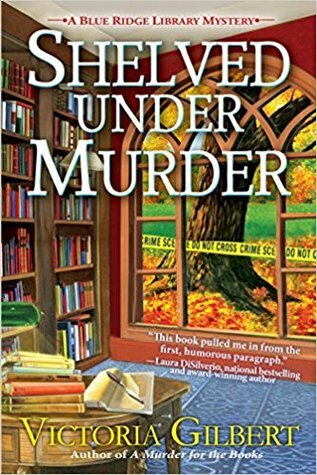 Why I Picked This Book: The first in the series was one of my favorite cozy mystery reads so I knew I couldn't miss this one. My Impression: I loved the first book in this series and was so excited for this one! This series has so many of my very favorite things that it's hard to believe it's not written specifically for me. There's a librarian who does research, there's some art theft, there some mysteries and scandals from the past floating up, a dead body or two, and even a touch of romance. I really loved seeing more of Richard's work and just what a professional dancer/choreographer does. As well, I felt we saw a bit more of Aunt Lydia and got to know her past more. I also found the added element of the library fundraiser and the relationship between the library director (Amy) and the head of the Friends of the Library group really interesting. The characters come alive from page one and the mystery had me invested early on. Amy's involvement did make sense given the art angle and the small town staffing limitations. I can't say the ending was a shock but I still enjoyed getting there. The pacing was fast, the characters were likable, and the mystery was thoroughly entertaining - what's not to love? Would I Read More of this Series/Author? Yes! Is the next one available yet? Would I Recommend this Book? If you enjoy bookish cozies you must read this series. I think you could jump in here with no problem but the first one is so fun it shouldn't be missed! Oh I love the view out that window (maybe minus the police tape) it looks so, well cozy otherwise. This is one I'll definitely keep in mind for my next cozy. Recently I read some cozy mysteries and I find that I like cozies. This one sounds good. I love cozies and don't read them often enough. This looks really good so I'll be checking the series out. I definitely need to check out this series! You'll have me drooling over cozies yet! I do have the first one in my TBR on GR. And when I have read through the Kate Carlisle mysteries ( book 1 which I have from the library) I'll consider this one as anything to do with books...!! This one does sound fun! I love the library bits! And yay for it being so good even when you had high expectations. I still need to start this series! Like the cover as well! I'm a total sucker for cozy mysteries!! Great review!